You want fewer distractions and less on your plate. You want more productivity from your work and more income for a better life. If there was just ONE Thing that could deliver extraordinary results would you do it? The Chamber’s NB Business University will host a seminar on Friday, January 19 to help business leaders accomplish more by doing less. The ONE Thing: Business Productivity & Time Management will be held from 11:30 a.m. to 1:00 p.m. at the Chamber in Honors Hall. Tickets are available at www.LearnInNewBraunfels.com. Only the ability to dismiss distractions and concentrate on your ONE Thing stands between you and your big goals. What’s the ONE thing you can do that by doing it everything else will be easier or unnecessary? The surprisingly simple truth behind extraordinary results. 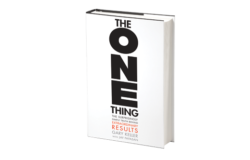 In the #1 Wall Street Journal and New York Times bestseller, Gary Keller and Jay Papasan identified that behind every successful person is their ONE thing. Join Don Hobbs, co-founder of MAPS Business Training, as he demonstrates that the results you get are directly influenced by the way you work and the choices you make. Learn how to identify the lies that block your success and the thieves that steal time from your day. By focusing on ONE Thing, you can accomplish more by doing less. Tickets are discounted for Chamber members at $55, available to the general public at $80 and include lunch. For more information and to purchase tickets, visit www.LearnInNewBraunfels.com.